My name is Nick, and I’m an Episcopal priest in the Dicoese of Newark. I’m honored to be one of the “Mockingbird at the Movies” contributors. I’d love (really) to know what you think of movies I suggest or talk about, so please post comments! For my first official Mockingbird at the Movies post, I thought I’d pay to tribute to my current favorite director. You know, the kind of guy whose movie you’ll see, no matter what A.O. Scott or Roger Ebert might think? Alexander Payne is the co-writer and sole director of Citizen Ruth, Election, About Schmidt, and Sideways. Of these, Election is, by leaps and bounds, my favorite. See it, but don’t see it with your mom. In point of fact, maybe don’t see any of these with your mom [Edit: he’s not kidding!]. Payne adapts novels for his screenplays, so can’t be given all the credit for the bleak human outlook, the painful humor, and the ultimate contentious pseudo-peace his characters find. However, the man is a genius for bringing it to the screen. Of special note is Rolfe Kent, his usual composer, who pokes musical fun at people and situations, and then, with a few chords, breaks your heart. See every one of these films. 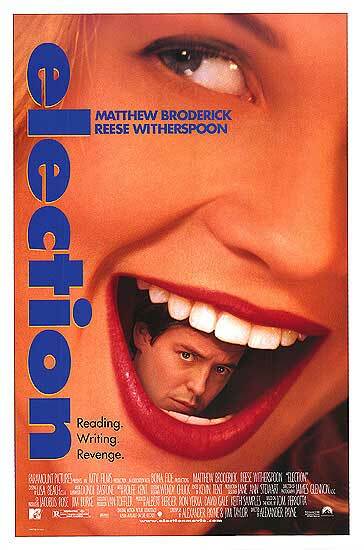 My personal rankings go 1) Election, 2) About Schmidt (watch for Dermot Mulroney and watch OUT for Kathy Bates), 3) Sideways (the resurrection of Thomas Haden Church), and 4) Citizen Ruth (the story of an Omaha huffer who gets pregnant, and caught between the radical right and left of the abortion issue). The joy of Payne’s films is to see great actors playing tragically normal people. These normal people will make you laugh, make you cry, and ultimately, just make you happy that they got into a movie. Thanks for these non-traditional picks Nick. If there are other people out there like me, I agonize over my DVD rentals because the last thing I want to do is spend 2.5 hours watching something completely awful. Also, as of last night, (after watching ‘Rendition’), I have a new-found respect for Witherspoon as an actress. So glad we get to hear your voice on M’Bird. Yes, my voice will soothe even the savage beast…if I can bring a good movie into a deserving home once in a while, I’ll feel good about my contribution to this world. Amazingly, we’re still friends a decade later. Thanks for this Nick. I wonder what Payne’s working on right now? I am counting the seconds until I can see Coraline this weekend. ELECTION is wonderful. Love it, love it, love it. Dear Nick, I feel like a “top 40” movie geek. I canceled my Blockbuster On line account and now use the Red Box. Will i even become a cool movie guy that way or do I need another source like Netflix or the Exchange? Please contribute to the world and help me overcome my movie geekhood.